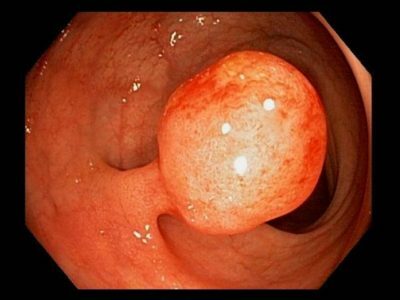 A polyp is an abnormal growth or projection from the inner lining (mucosa) of the bowel wall. This outgrowth is typically warty or mushroom-like in shape. What types of polyps are there? Colon polyps vary in shape and size, as well as the types, numbers and locations. Most colonic polyps are less than a centimetre in size. In terms of physical appearances, most colon polyps are mushroom-like, having a stalk. Others are flat (flat polyp) or carpet like (sessile polyp). What is the cancer potential of colon polyps? Adenomatous colon polyps have the potential of turning into colon cancer, given enough time. Therefore, patients with adenomatous colon polyps are at increased risk of developing colorectal cancer. Having the colon polyp removed at an early stage prevents the development of cancer in the polyp. How long does it take for a colon polyp to turn into colon cancer? Larger polyps have a greater risk of turning into colon cancer. It has been estimated that it takes about 5 to 10 years for cancerous change to occur. How do I know if I have a polyp? Unfortunately, most colon polyps are silent, especially when diminutive. Larger polyps can occasionally cause bleeding and rarely cause changes in bowel habits. As most colon polyps are silent and without symptoms, they are mostly detected on colonoscopy. Who is at risk at developing colon polyps? If you have blood in the stools or changes in bowel habits, investigations are recommended especially if you are more than 40 years of age or have a family history of cancer. In addition, those with a previous cancer or polyp removed are at risk and should have routine surveillance colonoscopy. Patients with known genetic syndromes such as Familial Adenomatous Polyposis (FAP) or Hereditary Non-Polyposis Colorectal Cancer (HNPCC) have a lifelong increased risk of developing multiple polyps and should undergo a regular screening programme. How is a colon polyp removed? Up to 90% of colon polyps can be safely removed via a colonoscopy. Small polyps are removed using biopsy forceps. Larger polyps are removed with a wire snare and electrocautery. Please visit http://clinicfordigestivesurgery.com/resources/colonoscopy for further information on colonoscopy. Removed colon polyps are routinely sent to the laboratory for analysis under the microscope to determine its subtype. The cancerous potential can then be determined after this analysis, and recommendations can be made for follow-up. How often will I need to have colonoscopy? If there were adenomatous colon polyps removed during the colonoscopy, the regular recommendation is to have a repeat colonoscopy the year after. However, if there were no colon polyps detected, the next colonoscopy can be scheduled 5 to 10 year after, depending on your risk profile. For questions about colon cancer, and on our Endoscopy packages, contact Clinic for Digestive Surgery at +65 6570 2702 to speak to SSN Karen, our Clinic Nurse. Alternatively, you could drop us an email at doctor@clinicfordigestivesurgery.com, or fill up the enquiry form at http://clinicfordigestivesurgery.com/contact and we will attend to you at the soonest possible time. Previous article "Doc, I've got indigestion"